Stomach beats a landfill any day. Lots of people know food waste is a major problem. Far fewer actually want to consume sour milk or days-old bread. Thankfully, a new app could give guilt-racked citizens sort of the Goldilocks method: not too fresh, not too old, food waste that’s just right. It’s called Food for All, Boston entrepreneur David Rodriguez’s graduation project while completing his MBA. The concept is pretty simple — it connects people who don’t mind the dregs from a vat of soup or the crusty last slices of pizza, if those items are still tasty, with restaurants that have leftovers that day. Users search their area for partner restaurants, pick a spot that sounds good, then go pick up the food before the eatery closes. Best of all, the extras cost 50 to 80 percent less than if you’d ordered them in the restaurant just hours earlier. 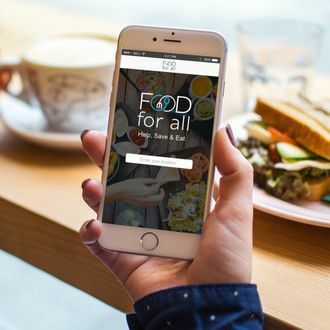 The app is still only in prototype, and right now the Kickstarter is short 24/25ths of its $50,000 goal with a month left, but Rodriguez tells BostInno that 30 Boston-area restaurants have already signed up to help pilot the app. If they hit their crowdfunding goal, he thinks they should be able to release Food for All in Boston and New York as soon as next summer. The one hitch: Don’t expect a menu, since this is about what’s left over at the end of the day. Restaurants would try to give users a vague idea of what to expect, but actual dinner will be a surprise.